Marcus Foiles beamed with excitement as he piloted an A-10 in the skies over a virtual southern Arizona landscape. Foiles had been in a flight simulator before, but today was a whole new experience. The odds of him sitting where he was at that moment in time were immeasurable. The last time Foiles held the simulator’s control stick was when he was 10-years old, after being diagnosed with leukemia. Davis-Monthan rolled out the red carpet for the young boy from Springfield, Ill., who was granted a tour of the Aerospace Maintenance and Regeneration Center with sponsorship from the Make-A-Wish Foundation. Two merged photographs present Marcus Foiles and retired U.S. Air Force Lt. Col. Gregg Montijo in an A-10 flight simulator during a tour at Davis-Monthan Air Force Base, Ariz., Jan. 27, 2017 (left), and July 1989 (right). Foiles was 10 years old in 1989 when he was granted a trip to D-M via the Make-A-Wish Foundation after being diagnosed with leukemia. Foiles made the trip back to D-M to reconnect with Montijo, the pilot who hosted the tour 28 years ago. In 2016, Foiles had the idea to reconnect with some of the friends he made during his trip to D-M. He was able to find Montijo’s contact information, so he decided to send him an email. Attached to the email was a weathered newspaper clipping of Foiles and Montijo behind the controls of an A-10 simulator during the visit in 1989. On Jan. 27, 2017, Foiles and his wife Melanie made the trip back to D-M to reconnect with Montijo, take another spin in the A-10 simulator, and have a quick look at an A-10 on the flight line. “Just to get caught up with him was awesome, and for the rest of this to be possible is exceeding expectations,” Foiles said. The A-10 simulator that Foiles flew this time around was generations ahead of the one in 1989. During the visit, Foiles and Montijo shared an easy rapport as if they had just seen each other yesterday. 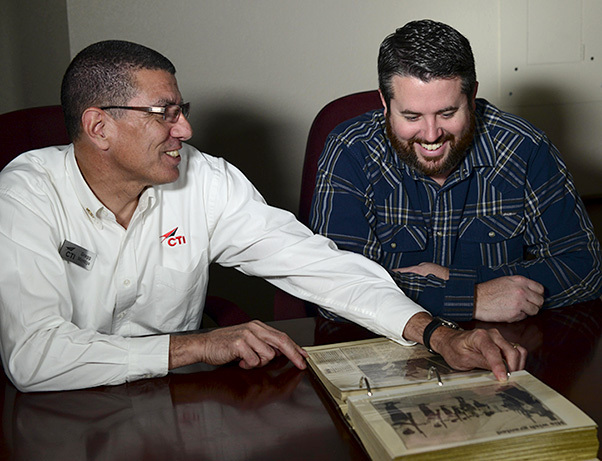 Retired U.S. Air Force Lt. Col. Gregg Montijo and Marcus Foiles look over a photo album at Davis-Monthan Air Force Base, Ariz., Jan. 27, 2017. Foiles brought along a photo album that his mother put together from the original trip. The book contained photos of the tour, old newspaper clippings, and a running commentary written by his mother in the margins. Foiles endured a total of two and a half years in chemotherapy, one of which followed the trip in 1989. But his visit to D-M provided him with memories he could reflect on for a lifetime. The Aerospace Maintenance and Regeneration Center transitioned to the 309th Aerospace Maintenance and Regeneration Group in 2007.